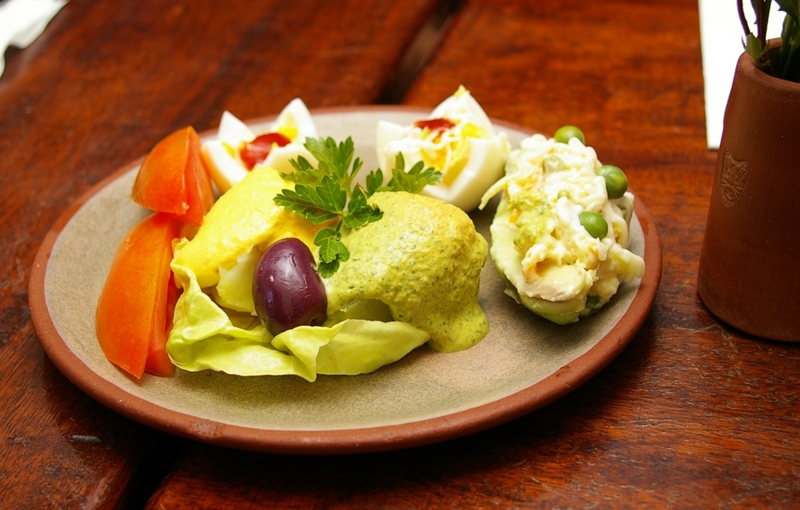 A combination of traditional Peruvian dishes suitable for vegetarians, including papa a la huancaína and papas a la ocopa. Photo by G M, flickr.com. It’s hard to find traditional Peruvian food for vegetarians. Most of the classic dishes are meat or fish based, so it’s not easy for a vegetarian to explore the world of authentic Peruvian cuisine. But there are a few options. I’m not a vegetarian, but I’ve tried my best to compile a list of authentic, unadulterated Peruvian dishes that are suitable for vegetarians, without simply being vegetarian spins on classic dishes (i.e. tofu ceviche or seitan saltado). Quite a few of the options below are typically served as starters or side dishes. Potatoes also feature heavily; Peru is king when it comes to potatoes, so that’s no great surprise. As a vegetarian, you might well get sick of spuds by the time you leave Peru. Be careful with some of the dishes mentioned here, particularly the soups, as they might have, for example, chicken broth bases. It’s always best to ask before you order. This list is also based on a lacto-ovo vegetarian diet, so eggs and dairy products have been included. If you can think of any more traditional vegetarian dishes in Peru, please let me know in the comments section and I’ll add them to the list. Papas a la ocopa — Papas a la ocopa is a traditional potato dish from Arequipa. Normally served as a starter, it’s a simple dish of sliced boiled potatoes covered in a creamy sauce of queso fresco, garlic, ají amarillo, peanuts and the wonderful huacatay (Peruvian black mint). Ensalada de chonta — Chonta, known more commonly outside Peru as heart of palm, is a textural wonder with a smooth subtle taste that makes it perfect for salads. It can shine in a green salad, or equally well in a quinoa salad. Ensalada de pallares — A clean, quite zesty salad made with pallares, otherwise known as Lima beans (a good source of protein and molybdenum, among other things). The salad often contains tomato, onion, parsley and key lime juice. Papa a la huancaína — Papa a la huancaína, like papas a la ocopa, is a dish of boiled yellow potatoes covered in a mildly spicy and creamy cheese sauce made from queso fresco, ají amarillo and evaporated milk. It’s often served on lettuce leaves with some black olives and a slice of hard-boiled egg. It’s extremely common across Peru, typically as a starter. Sopa de habas (chupe de habas) — Sopa de habas, or chupe de habas, is a simple but satisfying bean soup. Various versions exist, normally using onion, garlic and maybe tomato and yellow potatoes. Be careful, as some cooks might use chicken stock instead of water, so ask in advance. Sopa de quinua, a tasty, healthy and vegetarian dish from Peru. Photo by Robert Luna, flickr.com. Choclo (choclo con queso) — Choclo is basically regular corn, although the kernels are probably larger and less sweet than you’re used to. In the street, vendors sell choclo on the cob (corn on the cob), sometimes accompanied by cheese. It’s a great combination and especially handy when you’re on the move. Solterito arequipeño — A classic Arequipa salad dish of diced and mixed up bits and pieces, typically including beans, choclo (corn), onion, carrot, queso fresco, green olives, rocoto chili pepper, tomato and a touch of anise. Pastel de papas — Another dish from Arequipa, the pastel de papas (potato pie) is a simple but filling dish similar to the French potatoes au gratin. It’s built up with layers of white potatoes, cheese, eggs, milk and butter, before being cooked in the oven. Pastel de papas is often served as an accompaniment to dishes in restaurants and homes in the Arequipa region, or sometimes as a stand-alone dish. Tallarines a la huancaína — This spaghetti or noodle dish uses the same mildly spicy and creamy huancaína cheese sauce as used in papa a la huancaína. It’s normally served alongside chicken or beef (on one plate, e.g. tallarines a la huancaína con pollo), but you might find it as a side dish. Or you can try asking for it without the meat, ideally at a reduced price. Ensalada rusa — Enslada rusa is a Spanish potato salad that’s also popular throughout Peru, where it’s sometimes served as a starter. Peruvian ensalada rusa tends to be heavy on the beetroot, which gives it great flavor and a deep purple-red color. Along with potatoes and beetroot, other ingredients may include boiled and diced up carrots, green beans, mayonnaise and boiled eggs. For salty, crispy, meat-free goodness, you can’t go wrong with patacones (unless they’re fried in fat, of course). Photo by stephen velasco, flickr.com. Quinoa (in various forms) — When I was a kid back in the United Kingdom, I never thought I’d end up cooking with quinoa (quinua) at least twice a week. Back then it was just an expensive health food store item bought by New Age yoga enthusiasts. But now I love it, both for its texture and the way it carries other flavors. It’s great in salads, can easily go in soups, and makes a good (but more expensive) substitute for rice. You can also make cakes out of quinoa, too. So always keep an eye open for quinoa-based dishes — but always ask if they contain meat. Locro de zapallo — Locro de zapallo is basically a pumpkin stew (or thick soup) with potatoes and ají amarillo chili peppers (or paste). Garlic, cheese and choclo can all be added. 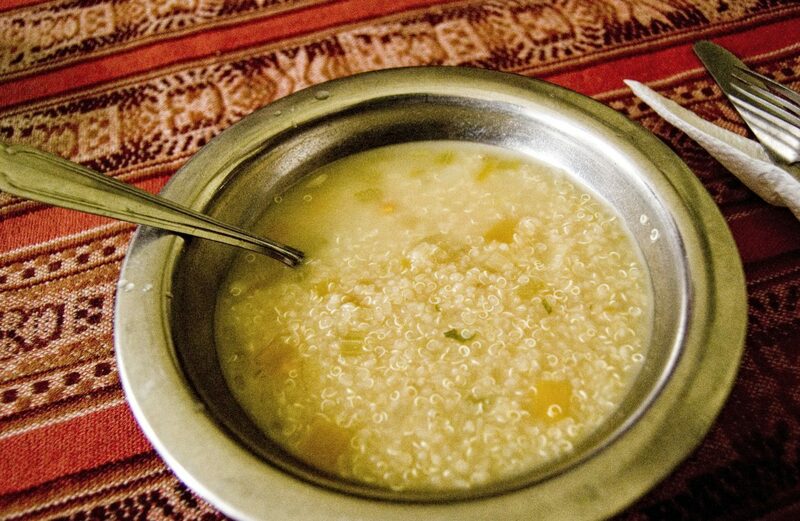 Although not traditionally meat-based, locro de zapallo can contain meat or meat stock, so ask in advance. Patacones — If you’re craving something hot and unhealthy, pick up some patacones. Patacones are basically twice-fried smashed-flat slices of green plantain, which ultimately form wonderful discs of golden crispiness. 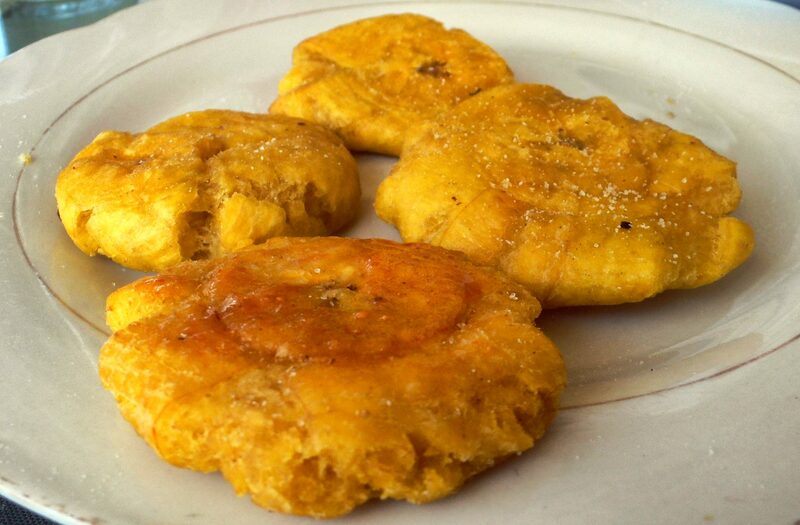 Popular in the Peruvian jungle (along with tacacho, another plantain side dish that normally contains pork rinds), patacones are vegetarian friendly unless they’re fried in some kind of animal fat. Mushroom ceviche — Ceviche is the classic Peruvian dish, especially along the lengthy Pacific coastline. But if you don’t eat fish, you won’t find many types of ceviche that you can eat. Unless, of course, you find a restaurant selling ceviche de champiñones, or mushroom ceviche. It’s not too common (and calling it “traditional” or “authentic” is a bit of a stretch, to be honest), but you should be able to find it in large cities like Lima, Cusco and Arequipa, especially in vegetarian restaurants. Escribano (arequipeño) — Escribano is a simple potato starter from Arequipa, which is why it’s often called escribano arequipeño. It’s basically a potato salad of mixed and mashed up potatoes, tomatoes, rocoto chili pepper, vinegar, oil, a bit of fresh parsley and salt and pepper. It’s actually pretty damn good — and incredibly easy to make if you want to cook your own vegetarian Peruvian dish. Tallarines verdes — This green pesto spaghetti is normally served with a chunk of beef or chicken, but it’s tasty enough to stand on its own (maybe with a fried egg). The pesto sauce is typically made with fresh spinach, basil, queso fresco, grated parmesan cheese, some chopped up pecans, evaporated milk, garlic, salt and pepper. Tequeños — These little beauties are made using wonton dough sheets, which are wrapped around cheese and deep fried to create crispy fingers. Tequeños are a classic bar food in Peru, and are also served as starters and side dishes in some restaurants. Be careful, as they’re sometimes filled with ham, so ask in advance. Tortilla de verduras — A simple vegetable omelette that you’ll find in quite a few restaurants. It’s also something you can ask for even if it’s not on the menu, as most chefs should be able to whip one up without much trouble. Do You Know More Vegetarian Dishes from Peru? If you can think of more authentic Peruvian vegetarian dishes, please let us know in the comments section below. Thanks! Hi, and thanks for commenting. I don’t think I’ve ever seen cevichocho in Peru. It’s more of an Ecuadorian thing, right? One of my favorite snack foods here which is usually vego (occasionally they add ham so it’s best to check) is tequenos with guacamole. I’m not sure it counts as a “traditional dish” but I think it should be on every Peruvian recipe list, just as it’s in every Peruvian restaurant and pub. Delicioso! Ah, great call, Bec! One of my favorite bar foods in Peru — I don’t know how I forgot tequeños. I’ll add them to the list. Thanks! My vegetarian friends always manage to find a meal in a restaurant by asking for a tortilla de verduras. No? Definitely, thanks, I’ll add it to the list.